Published: Dec. 20, 2017 at 03:11 p.m. 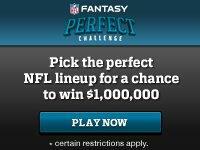 Updated: Dec. 20, 2017 at 03:32 p.m.
Below are the Perfect Challenge picks for Week 16 from The NFL Fantasy Stronghold. Drew Brees hasn't quite been the quarterback we're used to seeing in fantasy but Franchise likes his chances throwing to Alvin Kamara and Michael Thomas this week against the Falcons. Zeke's back and has a great matchup against a Seahawks defense that is a shadow of its former self. JuJu Smith-Schuster is in line for a lot more targets without Antonio Brown. Rob Gronkowski is a monster at tight end regardless of matchup. The Jaguars are always a smart choice. And Greg Zuerlein. Russell Wilson was ungood last week but Gelhar isn't worried about a repeat flop this week against the Cowboys. Without Antonio Brown, the Steelers should lean even more heavily on Le'Veon Bell. Hello again, Ezekiel Elliott. DeAndre Hopkins is almost completely matchup -- and quarterback -- proof. Stefon Diggs returned to our consciousness last week ... as did Greg Olsen. It was a fantasy Christmas miracle. The resurgent Ravens defense gets to feast on the Colts offense this week. And Jake Elliott. Nick Foles announced his presence with authority last week against the Giants and has an equally favorable matchup this week with the Raiders ... which should also work out well for Zach Ertz. Why wouldn't you start Todd Gurley? He's just the top scoring running back in fantasy football. Hola, Zeke! Michael Crabtree offers nice potential against an Eagles secondary that has had issues for the past couple of weeks. Larry Fitzgerald should just keep on keeping on against the Giants. The Ravens are still here. And Justin Tucker. Ben Roethlisberger has been on fire lately. Why should the Texans be the team to slow him down? Kareem Hunt should stay hot against the Dolphins defense. Christian McCaffrey is an outside-the-box play who gets an injury-decimated Buccaneers defense. Adam Thielen against a woeful Packers secondary and Doug Baldwin against a shaky Cowboys secondary feel like potentially big options. Zach Ertz is back. So is the Ravens defense. And Justin Tucker. Those are our picks for Week 16. Hit us up on Twitter with your lineup. Enjoy the games!